Why Can’t Uncle Come Home? addresses the anger, fear, and confusion a child feels when a beloved relative is sent to prison, and it explains how an innocent person might be convicted of a crime. The book succeeds in its own right, but it also fills a need, telling the young relatives of innocent inmates they are not alone. When her husband was accused in 2009, CJ and an army of other supporters stepped forward in his defense, and they have stuck with the campaign even after his conviction in 2015. In the course of the investigation, CJ showed herself both stronger and more ethical than a pair of Alaska state troopers, who thrust grisly autopsy photos in her face, ridiculed her faith in her husband, and misled her during a long and heartless interrogation. You can follow the family’s struggle through the Free Clayton Allison Facebook page. The Rasmuson Foundation, which supports artists and non-profits in Alaska, has awarded CJ a grant to publish a follow-up book, Timmy and Kate Go to Visit. Why Can’t Uncle Come Home? earned honorable mentions for its illustrations and cover design and for its handling of family issues in the 2018 Purple Dragonfly Book Awards from Story Monsters Ink, a magazine about children’s literature for teachers, librarians, and parents. CJ, a writer by both nature and training, has an MBA in Management & Strategy and a BA in Journalism & Public Communications. As CJ predicted, Why Can’t Uncle Come Home? is the only children’s book I could find that addresses wrongful conviction. Several books deal with parents in prison, including these titles that have received generally good customer reviews: The Night Dad Went to Jail; Far Apart, Close in Heart; and My Daddy’s in Jail. Customer reviews also give a thumbs-up to Maybe Days, a book written for children entering foster care. The State of New Hampshire publishes this list featuring more titles for children with parents in prison. Tagged as abusive head trauma, C.J. Allison, Christiane Joy Allison, CJ Allison, Clayton Allison, Free Clayton Allison, SBS/AHT, Shaken Baby Syndrome, Why Can't Uncle Come Home? After maintaining his innocence for 17 years, a California father was freed this winter when Sacramento Superior Court Judge James Arguelles overturned his murder conviction, citing evolving medical thinking about infant head trauma. Zavion Johnson said in 2001 that he had accidentally dropped his 4-month-old daughter Nadia in the bathtub, but he was convicted by medical testimony that the girl had been shaken to death. Then, in the years since his trial, two of the prosecution experts changed their positions. Prompted by Khari Tillery, a private attorney working pro bono, and Paige Kenab of the Northern California Innocence Project, both doctors provided affidavits saying they now believe a household fall could explain the child’s injuries. The case was closed in January of 2018, when the state dismissed all charges, according to J0hnson’s entry in the National Registry of Exonerations. I’m eager to see this new thinking at work on behalf of other innocent parents and caretakers convicted by flawed testimony about short falls—like the six people I wrote about in my 2014 post Short Falls, Long Sentences, who all remain in prison. I see progress, but it’s slow and halting. Child care provider René Bailey in New York was released from prison in 2014, when Judge James J. Piampiano vacated her murder conviction, citing what he called “a compelling and consequential shift in mainstream medical opinion” about pediatric short falls. Unlike Johnson’s prosecutor, however, Bailey’s refiled the charges. The court accepted Bailey’s plea and set a sentence of 12 and a half years, less than the 13 years she had already served, so she remains free but on probation. In New Jersey, meanwhile, a panel of appeal judges has upheld the conviction of Michelle Heale, a mother and babysitter who said the toddler in her care had choked on a packet of applesauce. Her conviction was based on the triad, with no signs of impact. In Kentucky, a young man has been sentenced to eight years in prison after accepting a plea deal—the newspaper report says he was accused of shaking but doesn’t specify the charges. He had reported an accidental fall. And I’ve recently come across a 2016 murder conviction in Oregon, where mother and babysitter Sarah Martin is serving a life sentence for the death of a 7-month-old who quit breathing in her care. She said she thought the boy had choked on a whole grain snack. “It is extremely frightening to know that this could happen to anybody. And in fact if you spend 10 minutes on the Internet, you will find out that it is happening all over the country,” he said. 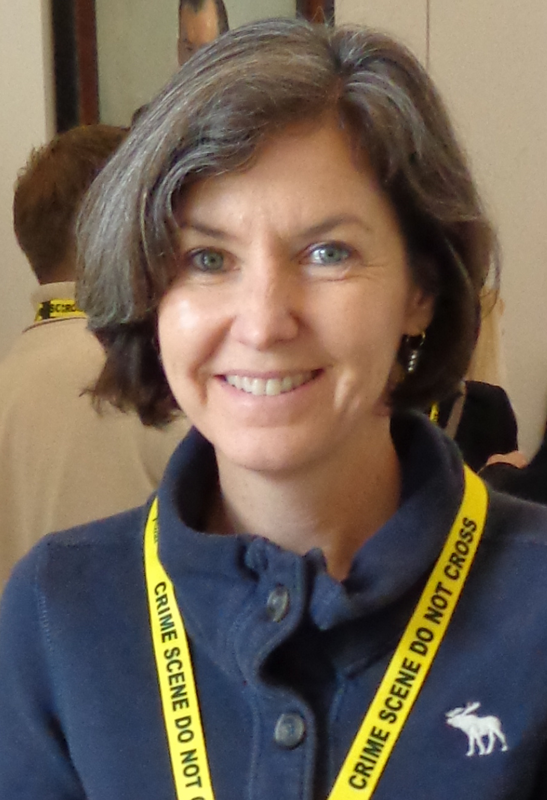 Reporter Erica Harper says she took that advice and found a number of disputed cases on line—the graphics show browser listings for a few of the classic critiques of shaking theory, like the NPR interview with Dr. Norman Guthkelch; the 2016 Washington Post exposé; and the Time magazine treatment of the Annie Li case in New York. But none of these treatments seems to have had a noticable impact, any more than Lee Scheier’s 2005 treatment in the Chicago Tribune, Emily Bazelon’s 2011 treatment in the New York Times, or the 2011 collaboration among ProPublica, PBS “Frontline,” and NPR—all of which I’d hoped would help wake up the world to the ongoing injustice. Because short falls are a theme of this posting, I end it with a video demonstration prepared by emeritus physics professor Richard Reimann, who used an SBS demonstration doll to illustrate one difference between shaking without impact and a short fall. See also his analyses of various fall scenarios, with excellent illustrations. If you are not familiar with the debate surrounding shaken baby theory, please see the home page of this blog. Arizona trial attorney Randy Papetti has brought nearly 20 years of experience and research to his valuable new analysis of shaken baby theory in the courtroom, The Forensic Unreliability of the Shaken Baby Syndrome, now shipping from Academic Forensic Pathology International. Papetti is not a criminal attorney but a recognized leader in his primary field, commercial litigation. In 2013, he was selected by Best Lawyers and his local peers as the Lawyer of the Year for “Bet-the-Company Litigation.” In 2011, he was inducted into the invitation-only American College of Trial Lawyers. His shaken baby work has all been pro bono. Papetti was only doing a favor for a friend, he told me in a telephone interview, when he agreed to help with his first alleged shaking case, an appeal of a murder conviction. The convicted father had reported a fall from a high chair, but the child abuse experts had insisted that shaking must have been involved. Papetti started researching the medical and legal arguments, he said, and found himself face to face with the difference between medical opinion and proven scientific fact. Papetti won that appeal, and other attorneys started approaching him with their own shaking cases. He was a key player in the 2012 freeing of Drayton Witt, whose son died after a short lifetime of serious health problems, including a seizure disorder. It was the Witt case that brought pioneering pediatric neurosurgeon Dr. Norman Guthkelch back into the arena, four decades after he lay the groundwork for the diagnosis by proposing that shaking an infant could cause subdural bleeding. Like Papetti, Dr. Guthkelch rejected the medical thinking that had convicted Drayton Witt. Guthkelch then spent the final years of his life fighting what he considered a “tragic misinterpretation” of his work. Papetti said he was “stunned” to see how child abuse professionals have lashed out personally at defense experts and attorneys: ridicule at conferences, perjury charges, letters to employers. “That’s not the way the game is played,” he said. Attorneys in civil practice fight hard in the courtroom, he claimed, but can still respect their opponents professionally and maintain personal friendships. These institutional realities, not science or clinical validation, best explain how SBS has persisted and why the medical profession is unlikely to correct it any time soon. So he keeps chipping away at a calcified theory with the facts, hoping to explain it all clearly enough that judges will see how decades of unproven medical testimony have led to a criminal justice crisis of staggering proportions. If you are not familiar with the medical debate surrounding shaken baby syndrome, please see the home page of this blog. The July issue of Acta Paediatrica offers a collection of free, live links to a volley of rebuttals published over the past four months to an article in March submitted by medical ethicist Dr. Niels Lynøe and most of the other experts who informed the 2016 Swedish report critical of shaking theory, commissioned by a government agency whose name is abbreviated SBU. The March paper reported on the same research as the SBU study, an exhaustive evaluation of the shaken baby literature that ultimately declared the scientific evidence behind shaking theory “weak.” The analysis noted fundamental problems with the bulk of the published research—in a typical study design, the report noted, researchers had applied the criteria they were attempting to prove when identifying and sorting their subjects, so the results necessarily supported their theory. In refutation of the straw man argument, I point out that both Joshua Burns and Michelle Heale were convicted based only on the opinion of child abuse experts that the triad proves abusive head trauma—these cases are not unique, only easy to reference here. I myself have researched dozens of convictions based on the triad, sometimes on only one or two elements of the triad. Like other critics, including Lucas et al., the Bilo authors accused the SBU of applying a double standard, because the reviewers accepted individual case reports as evidence for other causes, while they rejected studies with fewer than 10 cases from their main literature review. 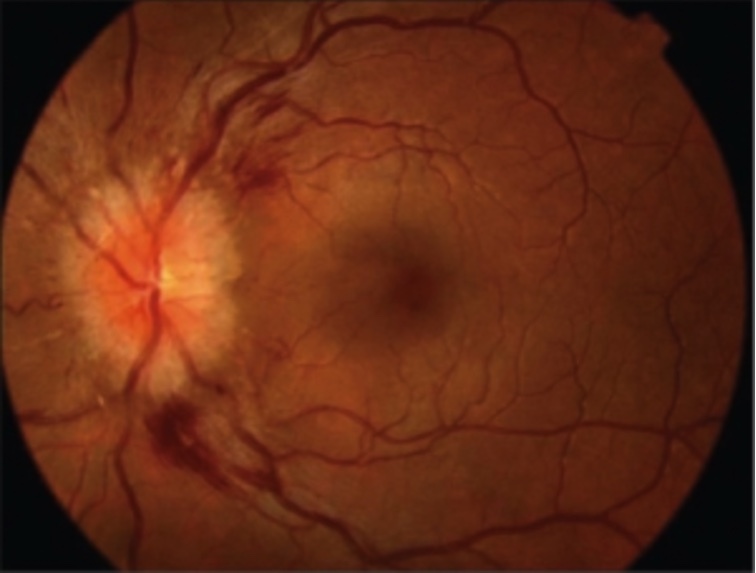 With what certainty can it be claimed that the triad, subdural hematoma, retinal hemorrhages and encephalopathy, is attributable to isolated traumatic shaking (i.e. when no external signs of trauma are present)? 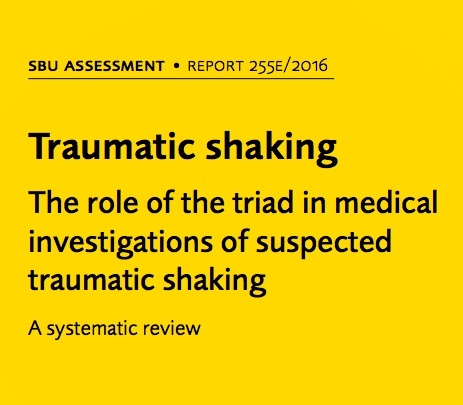 That is, the researchers found some low-quality papers supporting the opinion that traumatic shaking causes the triad—two French papers based on confessions—but no medium- or high-quality papers. Before reaching their conclusions, the authors had read and evaluated 1,000 academic papers, only 30 of which met their inclusion criteria. 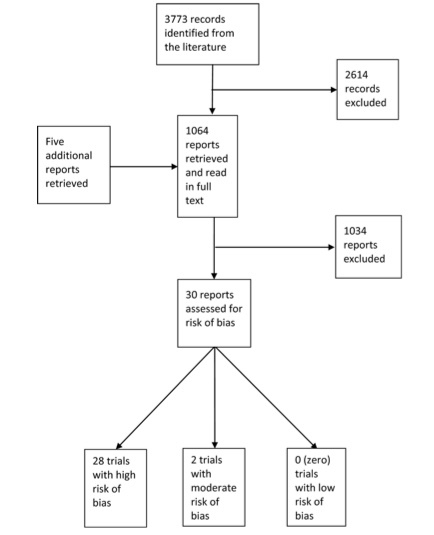 They ranked 28 of those 30 papers as having a “high risk of bias,” 2 of them as having a “moderate risk,” and none of them as having a “low risk” of bias (a flow chart illustrating the literature search). If you are not familiar with the debate surrounding shaken baby syndrome/abusive head trauma, please see the home page of this blog. The landscape in the shaken baby debate is shifting again, with a series of developments that have locked in gains, slowed losses, and even claimed new ground in the struggle against unproven science in the courtroom. In New York state last week, an appeals court affirmed the 2014 reversal of the murder conviction of care provider René Bailey, who said she was out of the room when a little girl jumped or fell from a chair. Prosecution experts had testified, however, that only shaking could explain the brain findings, and that children don’t die from short falls. In his decision reversing the conviction, Judge James Piampiano accepted the argument by Bailey’s appeal attorneys that changes in medical thinking since her 2001 trial constituted new evidence. During the trial, Bruns said he thought Levi was choking, so he quickly picked him up and tipped him upside down to clear his airway. Five minutes later, according to Bruns, Levi turned pale, and his eyes rolled to the back of his head, leading Bruns to run him to a nearby hospital. The Sunday Times last week published a more detailed treatment of Dr. Squier’s story than appeared in the early news reports—you have to register with the Times to see the article, but the process is free and reasonably painless. The past few weeks have also brought a number of disappointments—in Michigan, a second trial resulted in another guilty verdict against Leo Ackley, whose first conviction had been vacated on appeal, and an appeals court affirmed the conviction of Joshua Burns, who has served his jail time and reunited with his family, although he remains on probation. Both appeals had been pressed by the Michigan Innocence Clinic, which has been focusing on shaking cases. Leo Ackley’s family insists they will keep fighting for him, and last month the Michigan Innocence Clinic won a grant to help defend clients who may have been wrongfully convicted in shaking cases. Despite two disappointments this season, the clinic will surely keep up the pressure against a flawed theory that’s been winning in court way too long. I hope the press, the public, and professionals in the arena stay tuned as the debate unfolds. A Swedish agency charged with assessing health technology and social services has published a review of the shaken baby literature declaring the scientific evidence for shaking theory “weak” and noting that a number of other medical conditions can cause the findings typically used to diagnose shaking injury. The posted report from the SBU (Statens Feredning för Medicinsk Och Social Utvärdering) is in Swedish, so I am relying on a Google translation and private email exchanges with native Swedish speakers for this summary. The SBU team looked only at cases of pure shaking, without evidence of impact, in children younger than 12 months, and they set standards regarding sample size, study design, and more. Their literature search strategies yielded 3,773 abstracts, and they screened 1,065 of the articles in full text. Only 30 of the papers met their reliability guidelines. The authors ranked two of those papers as medium quality, designating 28 of them low quality and none of them high quality. Both papers used confessions to identify abused children—the report noted that neither paper provided details of the circumstances in which the confessions were obtained. It can be concluded that, in general terms, the scientific evidence for the diagnosis of violent shaking has turned out to be uncertain. The diagnosis of “shaken baby syndrome” has previously been questioned both medically and legally. Now comes the SBU and Smers investigative report argues that the evidence of [shaking violence] not measure up. Mats Hellberg, a board member of the Swedish group RFFR (Riksförbundet För Famijers Råttigheter, or National Association for the Rights of Families), reports that the Swedish child protection teams are objecting that the SBU’s conclusions will make it harder for them to protect children in the future. “Positions are extremely polarized and group thinking is strong,” he wrote. In addition to criticizing the existing literature, the report suggests the kinds of research that would help resolve the ongoing debate about shaking theory. I hope the SBU analysis, which I’m told is now being translated into English, will trigger more reflection, more rigorous research, and more clear thinking about shaken baby theory. “Medical and biomechanical research, clinical and pathologic experience, and radiologic evidence have confirmed the understanding of the range of mechanism that contribute to brain injury from these forms of abuse. I think it’s fair to assume the AAP is now working on a rebuttal. If you are unfamiliar with the debate about shaken baby syndrome, please see the home page of this blog. Dr. A. Norman Guthkelch, the pioneering pediatric neurosurgeon who first proposed in print that shaking an infant could cause bleeding in the lining of the brain, died quietly last week in Toledo, Ohio, a month short of his 101st birthday. “Until the very end, Norman continued fighting for innocent children and families,” said Kim Hart, his caretaker and colleague and the director of the National Child Abuse Defense and Resource Center (NCADRC), who shared her home with Dr. Guthkelch for the last two years of his life. Last year, just before he turned 100, the two of them helped a local mother regain custody of her twins following a hasty diagnosis of abuse that had ignored the children’s medical histories. Dr. Guthkelch devoted his final years to working against what he considered a misinterpretation of his work, the model of shaken baby syndrome that has been winning in court for several decades. “I am frankly quite disturbed that what I intended as a friendly suggestion for avoiding injury to children has become an excuse for imprisoning innocent parents,” he told me in an interview in 2012. When he wrote that paper, Dr. Guthkelch launched an education campaign to stop the practice of infant-shaking in Britain, recruiting the help of case workers who made home visits to new parents. He then pursued other professional interests and didn’t revisit the shaken baby discussion until 2011, when law professor Carrie Sperling with the Arizona Justice Project asked him to review the medical records in the case of Drayton Witt, a father convicted of murder in 2002 for the presumed shaking death of his son. “I wasn’t too keen on this at first, as I’d retired at least a decade earlier,” Guthkelch sighed in a 2012 conversation, but he examined the records and was “horrified” to discover that 4-month-old Steven Witt had suffered a lifetime of medical problems that could easily explain his death. Dr. Guthkelch’s affidavit helped convince an Arizona state court to vacate the conviction and free Drayton Witt after a decade in prison. After exploring the medical literature, he concluded that “dogmatic thinking” had set in among child abuse physicians, who had come to believe that a certain constellation of brain findings, including retinal and subdural bleeding, proved abuse. He began articulating his protestations against the common knowledge, in letters to key players and in an essay to accompany an influential 2012 law journal article by a team of attorneys and physicians concerned that shaken baby theory is convicting innocent parents and caretakers. Oxford, 1945. 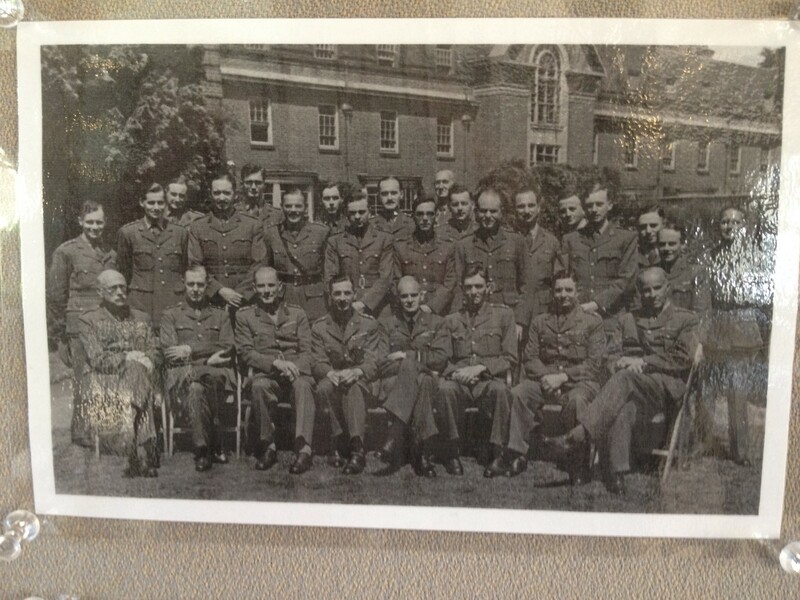 Dr. Guthkelch is second from the left in the back row, under the open window. Dr. Guthkelch began his career at a time of tremendous need. During World War II, right after his residency training, he served as an army neurosurgeon—during the Battle of the Bulge, he once told me, he staffed the operating room for 36 hours straight, breaking for food but not for sleep. After the war, he returned to his studies under pioneering neurosurgeon Sir Geoffrey Jefferson, who had honed his own skills treating head injury during World War I. Away from the battlefield, Guthkelch found himself specializing in the very young. He became Britain’s first physician with the title of pediatric neurosurgeon when he received that appointment at the Royal Manchester Children’s Hospital. Dr. Guthkelch emigrated to the U.S. in the mid-1970s, working at the Children’s Hospital of Pittsburgh until 1982. He intended to retire at that time, he said, but when he and his wife moved to Tucson, Arizona, the local hospital recruited him for another eight years of practice. Contributions in memory of Dr. Guthkelch can be made to the National Child Abuse Defense and Resource Center. For a profile of Dr. Guthkelch from 2012, please see Dr. A. Norman Guthkelch, Still on the Medical Frontier. For a video interview with Dr. Guthkelch, prepared for a 2013 conference of accused families, please see Conversations With Dr. A. Norman Guthkelch. For the National Public Radio treatment of his concerns, published in 2011, see Rethinking Shaken Baby Syndrome. Dr. Guthkelch meets with students from the Medill School of Journalism. For a podcast interview prepared by students at the Medill Justice Project, see Setting the Record Straight. For a review of his concerns regarding shaking theory in the journal Argument & Critique, see Integrity in Science. For his own informal memoir, also published in Argument & Critique, see Arthur Norman Guthkelch: An Autobiographical Note. If you are not familiar with the debate surrounding shaken baby syndrome, please see the home page of this site.